Sometimes caring for your laminate floor requires more than just a regular mop and a bucket of water. The best way to keep your floors looking their best is to invest in a quality mop – a mop that’s made specifically for caring for laminate floors. Through regular cleaning and with the right mop, you’re guaranteed to keep your house clean and is also very important in prolonging the life of your floor. With so many different mops in the market, it can be intimidating trying to choose the best that’ll leave your floor looking fresh and in its best condition. As such, it is important that you familiarize yourself with the different kinds of mops that are ideal for laminate floors. But first, you need to understand the differences between vinyl, plank and laminate flooring. Vinyl plank mostly is a hundred percent synthetic, but the core layer tends to be a thick multi-layer PVC. It’s also known as luxury vinyl flooring and comes in tiles or planks. The thickness of the vinyl is about 1.5 to 5 mm making it thinner than laminate flooring. Laminate flooring, on the other hand, is similar to vinyl planks in terms of the installation and looks but the major difference is that its surface is normally a hard plastic laminate that has a printed design layer. The core is usually a rigid fiberboard which is made from wood products that are bound together by melanin resins. Its thickness is 6 to 12 mm. Basically, a mop consists of a pole or a stick to which are attached bundles of coarse yarn or string or in some cases a sponge, piece of cloth or any other material that’s absorbent and used for soaking up liquid when cleaning floors or simply mopping up dust. To put it simply, the benefits of using a mop on a laminate floor are endless because it leaves your floor looking clean and fresh and the floor doesn’t wear out easily unlike when you are using other cleaning materials. One of the most annoying things you may experience when you’re cleaning your laminate floor is the dirt and streaks that tend to be left behind. Depending on the mop you choose, you won’t have to worry about cleaning the floor all over again. Microfiber mops for instance, unlike sponge or string mops, don’t leave behind this streak of dirt forcing you to start over. Stains are inevitable but when they’re on your laminate floor, it’s beauty is lost. However, with the right mop, those stains will be long gone and your floor will be as good as new. Steam mops, for instance, are the most ideal in the removal of stubborn stains on your laminate floor. The last thing you want on your laminate floor is ugly scratches from cleaning materials. That’s why what you need to consider when using mops to clean your floor is that they don’t leave behind scratches on the floor or your furniture. A microfiber mop, for instance, does an excellent job in ensuring that your laminate floor remains in good condition no matter how many times you clean it. The fact that there are different kinds of mops ideal for laminate floors makes them versatile. Depending on the cleaning you’re doing, whether dry or wet, you’ll always have options. A majority of laminate mops are light in weight and able to clean without too much pushing or scrubbing. At the end of it all, you’re less likely to feel tired because you won’t have to put your back into it when you’re cleaning. A lot of laminate floor mops have large mop heads. This combined with the swivel feature of the mop helps cover way more space than you would with other cleaning materials. As such, you end up spending very little time cleaning your house. This is especially true with microfiber and spin mops. If you have a laminate floor, you know that water is not the best option when cleaning. But even without water, laminate mops still do a good job in reaching even the grout lines and depressed areas of the floor. Both dry and wet mops are designed to trap fine particles, dust as well as hair when you swipe them across the laminate floor ensuring that you always do a thorough job whenever you clean. 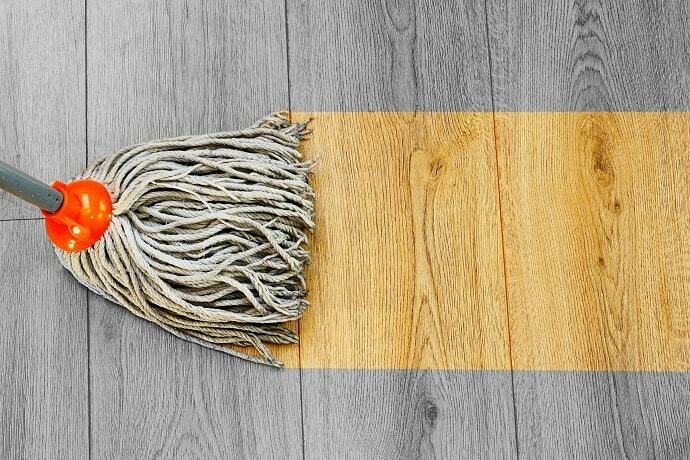 When it comes to laminate floors, one important thing you should be aware of are different types of mops out there. One thing to note is that debris is likely to be left behind after cleaning and may stick to the mop hence it’s advisable to clear the floor of debris either by a vacuum cleaner, broom or a portable car cleaner. Sponge mops basically consist of a rectangular shaped thick sponge that’s attached to a long pole or stick. Sponge mops also have a flat plastic or metal that’s attached close to the sponge but with a shorter handle. 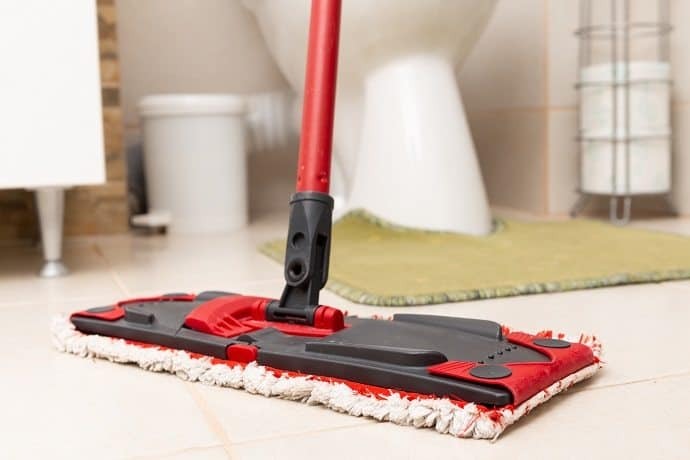 In order to wring out the mop when you’re cleaning, you only need to squeeze the handle inwards and the flat part of the handle will compress the sponge removing excess water. This type of mop is ideal when it comes to cleaning uneven floors like those with tiles. This is because the mop is very efficient in getting between the grout lines or the depressed areas of the floor. While the sponge mop is efficient in cleaning, it can harbor bacteria, but you can prevent this by rinsing it after every use. Additionally, after every use, ensure that you store the mop at a place where it can dry thoroughly because the moisture that remains is what causes bacteria to grow. Ask anyone and they’ll tell you that the first thing that comes to mind when they decide to buy a mop is the string one. Basically, a string mop is made of cotton strings that are bound together and attached to a mop head. The string mop unlike the sponge one doesn’t have a wringer but instead has one inside the mop bucket. To remove excess water, place the mop inside the wringer and then squeeze the handle which will require some pressure. The good thing about string mops is that compared to others, they are much cheaper and tend to hold more water for a thorough cleaning which isn’t ideal for laminate floors. In addition to this, the string mops aren’t durable since they fall apart easily which means that you’ll have to keep on replacing the mop head or the entire thing regularly. Microfiber mops may be confused with string mops because the two look similar. The difference, however, is that instead of the cotton strings, microfiber mops have microfiber strips that tend to come off the head of the mop. The mops are highly absorbent and not to mention very easy to care for since you can just throw them in the washing machine killing any bacteria that may be building up after cleaning. Microfiber mops are non-abrasive as well which means that they won’t leave any scratches on the floor. When it comes to cleaning, steam mops work by producing steam hence require water to operate. The steam temperature is ideal in killing bacteria and germs both on the floor and the mop head. Besides that, steam mops are great in removing tough stains from the floor. However, the biggest advantage has to be that steam mops don’t work with chemicals which means that your floor retains its original condition and you don’t have to worry about odors. The downside is that they require maintenance of the water tank and you have to use distilled water always to avoid the build-up of minerals on the components of the mop. Spin mops as the name imply make use of spinning heads to treat the floor including laminate ones. They are mostly dry which means that they don’t need water or solutions to work although there are models that can be both spray and spin. They are ideal for regular dirt, dust and stain removal that’s moderate. They, however, will not work like steam mops in case of tough and sticky stains. 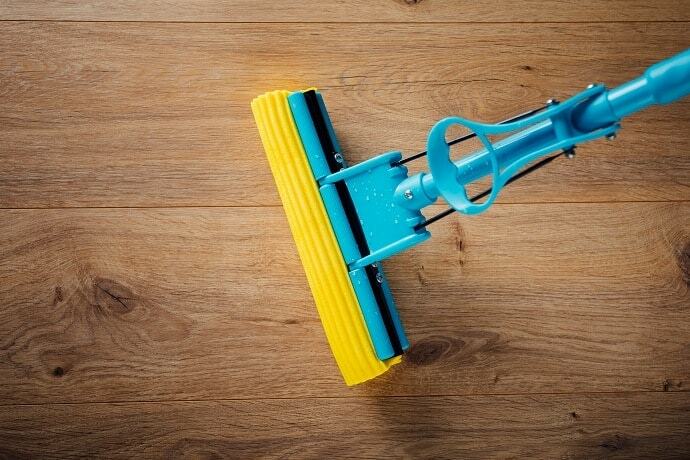 When it comes to caring for your laminate floor, dry mops are very convenient since they don’t require water. Also referred to as dust mops, they have a fabric head or a disposable pad that can be replaced after every use. The mops are designed to collect as well as trap dust, fine particles and hair when you swipe them across the floor. When you’re mopping, ensure that the head of the mop is in contact with the floor, lifting the mop only when emptying the collected debris into the trash. Dry mops are ideal in wiping up dry things on the floor and haven’t been designed to absorb any spilled liquid, unlike wet mops. When it comes to cleaning, there are so many ways you can approach the removal of dirt on a laminate floor. Most of the time laminate floors don’t require soaps and oil-based cleaners. When choosing a mop, you want to go with one that has microfiber pads, a sturdy handle and a broadhead. However, you’ll still need to apply water or cleaner to the floor in which case a spray bottle will work just fine. Some high-end manual mops feature onboard cleaner dispensers where the spray bottle is attached to the mop. The design of the mop comes into play when cleaning laminate floors in that the mop does the sweeping and sucking of water from the floor. 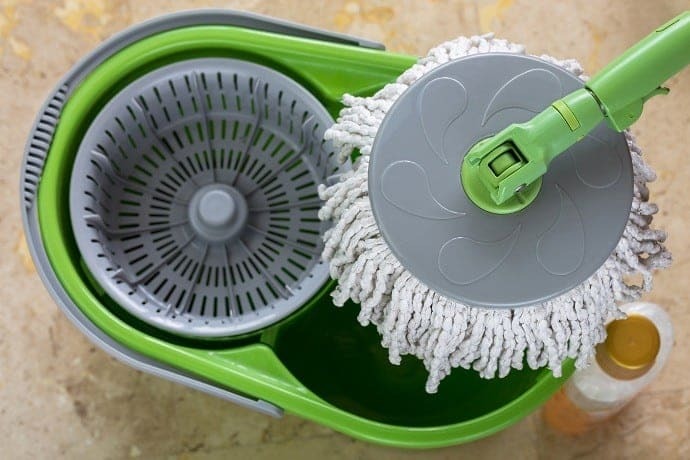 When it comes to mops, there’s also the steam option that’s supposed to remove stubborn stains and kill germs and you don’t have to use a lot of effort. There are also robotic mops that are supposed to make work easier by detecting where they have already cleaned so that they don’t clean the same spot twice. While a majority of the time the lightest mop will not always win, at the end of the day, it usually does. By nature, mopping the floor is labor intensive and as such a heavy mop wouldn’t make much sense in this. You also want to be in a position to mobilize the mop to wherever you need to clean without using too much effort. Adjustable handles come in handy in terms of custom functionalities of the mop. However, one thing you need to understand is those mop operators are different hence the ability to adjust the handle of the mop for optimum performance is very important. While talking about handles, it’s worthwhile mentioning that the swivel action is equally important. This is because the flexible function enables the pads of the mop to reach even under the furniture, kitchen cabinets and behind toilets. A lot of the time, pads are crucial on a laminate floor mop. Most manufacturers will include a couple of protection floors pads with their mops. What you need to ensure when buying a mop is that it actually has mop pads included. This is because reusable pads don’t last long so it’s better if you have options where you can get others easily when it’s necessary. The other thing you should consider is the kind of pad, for instance, dust and wet ones. This is because different pads provide some versatility to the cleaning and allow you to take care of your laminate floor much better. When it comes to choosing the best mop for your laminate floor, you need to pay attention to the attachments that come with the mop. This is because the mop attachments allow you to reach the crannies as well as the nooks and confined areas when you are cleaning. This allows you to conduct a thorough cleaning without putting too much effort. Of course, when all is said and done, you need a mop that will last you more than a few weeks or months. The durability of the mop is, therefore, something that you should consider. String mops, for instance, wear out quicker that microfiber or sponge ones. When considering the lifespan of the mop consider the mop pads as well or at least buy a mop that has two pads. At the end of the day, however, if you want your mop to last, ensure that you clean it well after every use and store it well. Sometimes when you’re looking for the best vacuum cleaners while on a budget, it’s tempting to go for the cheapest one you can find and this happens even when buying a laminate mop. You want a mop that’ll last you for years and that’s why you should consider the type of mop you’re buying. String mops are less durable hence cheaper while microfiber mops perform to the optimum but will be more expensive. Consider going with a more expensive model if you want to opt for quality. 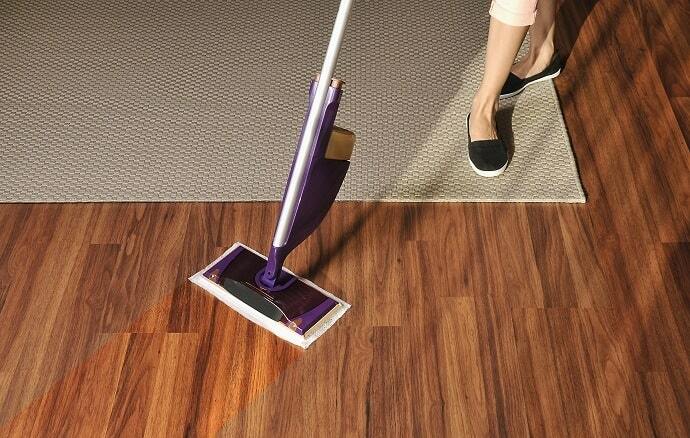 You also want a mop that’ll still retain the condition of your laminate floor no matter how many times you clean it. When buying a mop for your laminate floor, an expensive mop means more convenience. Some models feature powered microfiber pads or brushes that can clean, vacuum or polish with every mop push. Another function that you’ll find in expensive mops is steam technology. While not every manufacturer will support steam based cleaning on their products, if you get the right mop that has adjustable stem settings, it’ll serve you efficiently. Other features will include cleaner dispensers and may include mop pads to tackle various mopping and sweeping tasks. As mentioned before, you should consider using distilled water that can be dispensed from the mop. The mineral build up can end up destroying mechanisms and water life in time render making useless the water dispensing functions of the mop. The key to succeeding is using disposable microfiber mop pads to keep the pads clean as well as dry. Most reusable pads can be used either 30 to 40 times although sometimes they last longer. You can also wash and dry them easily. In case the floor is too dirty, you should rinse the mop under a pressured sprayer. Powered mops, on the other hand, require more effort though will clean better than the others. Always ensure that you rinse scrub the brusher after use and wipe the base of the mop. While at it, don’t forget to empty the water tank before storing it. When it comes to maintenance of laminate floors, sometimes doing less is way better. In that case, floor cleaning solutions or even oil soaps aren’t ideal when you’re scouring a laminate floor. Streaks, sticky residuals and other damage will often be the result when you use normal household solutions. When caring for your laminate floor, you need to be a bit flexible in terms of the cleaning solutions that you use. 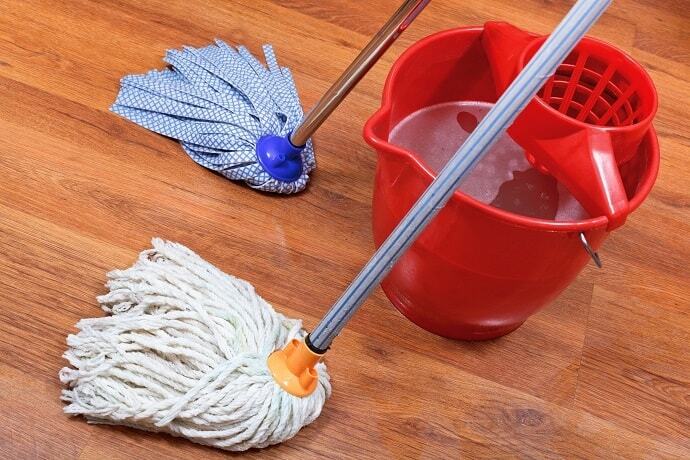 Some manufacturers of mops tend to make specific cleaning solutions for laminate floors. If that’s not an option, you can make your own cleaning solutions which can end up saving you money and minimizing the damage of your floor by chemicals. The best option for a not streaky clean laminate floor is the use of plain water. However, you can add a little vinegar for that deep cleanse. Distilled water, however, should work just fine. Steam, which is a variation of water, can also be used to kill germs and restore the floors to their shiny state. You must agree that a high-quality laminate floor tends to give a more than impressive look. Laminate floors combine wood, resin and plastic hence they are more durable, have a clean look and are easy to maintain. When it comes to cleaning the laminate floor, you can use different kinds of mop cleaners mentioned like microfiber, sponge, dry and wet. One of the major issues that a majority of people encounter when they are cleaning laminate floors is the residue that often remains. While there are many effective cleaning solutions that you can use for this, sometimes these cleaners can leave your floor looking worn out even after you have cleaned it. Besides that, it can also affect the look of your floor and can make it slippery and more prone to slipping. A stem cleaner requires no chemicals and instead will apply evenly distributed steam on the mop head giving you a beautiful, clean floor. What are the best cleaning type solutions with a mop for laminate floors? When it comes to cleaning solutions you can use when cleaning laminate floors, plain distilled water is always the best option. If that’s too boring for you, there’s no harm adding just a little vinegar in the dispenser. One thing to note is that while this will work for most mops, vinegar tends to wear out the wheels of robot mops hence you should steer clear of it. Consider using steam since it has no chemicals and is very effective in removing stubborn stains on the floor. What is laminate floor made of? Laminate floor is made of a combination of wood, plastic and resin hence it’s very easy to maintain and has a shiny, clean look always. Which preparations do I need before using the laminate mop on my floor? Before you begin cleaning, clear the floor from debris. You can use a vacuum cleaner or a broom to do it. A vacuum for hardwood floors is however more effective. This ensures that you clean every nook and grain that you may not reach with a mop. Which cleaner is recommended to use with laminate floors? The best cleaner is water and steam since they have no chemicals that can wear out your floor. You can also make your own cleaning solution since you’re able to customize the ingredients to your liking. At the end of the day, you want to care for your laminate floor the best way you can. However, there are so many mops in the market enough to get you confused when buying one. As you have seen, you need to consider things like your mop needs, its weight and mobility, pad material, price, attachments as well as the durability of the mop. You can now use this guideline to purchase the next laminate mop that’ll last you for years and will serve its intended purpose without ruining your floor or furniture. Photos from: vvoennyy / depositphotos.com, taviphoto / depositphotos.com, nikkytok / depositphotos.com, Thunderstock / depositphotos.com, flisakd / depositphotos.com and sasimoto / depositphotos.com.